There are a lot of fads, blogs and strong opinions, but then there’s SCIENCE. 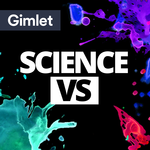 Science Vs is the show from Gimlet Media that finds out what’s fact, what’s not, and what’s somewhere in between. We do the hard work of sifting through all the science so you don't have to. This season we tackle immigration, climate change, true love and artificial sweeteners. Podcast: Science Vs: Artificial Sweeteners - not so sweet? Low calorie, no calorie and so sweet. Artificial sweeteners just seem too good to be true. Is there a catch? We dig into two big questions: Do artificial sweeteners cause cancer, and are they making us fat? We talk to Prof. John Glendinning, Prof. Susie Swithers, Dr. Kieron Rooney, and PhD student Jotham Suez about the latest research. Plus we do a fun experiment with PJ Vogt and Alex Goldman from Reply All!